And the posters don't lie. It does look spectacular. I found myself thinking how fortunate we are to live in an age when movie visuals can really live up to the imaginations of writers and paint such fabulous spectacle on stage. And then I found myself thinking about a recent twitter exchange on Hollywood's over-fondness for spectacle at the expense of plot and characterisation. 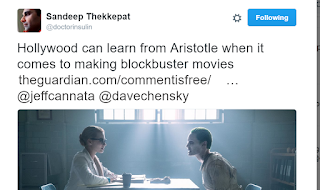 In his Poetics, Aristotle, as this article points outs, tells us that plot is the first and most important element in drama, followed by character, then dialogue, then spectacle. Spectacle is the least important. It's the bow that dresses up the overall package, a fact that Hollywood seems to have forgotten. In the BFG plot is not forgotten. How could it be, when it had already been neatly provided by Roald Dahl? 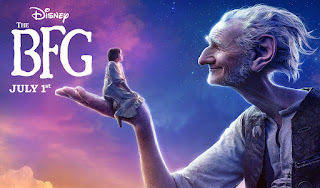 Girl (Sophie) sees giant; girl is snatched by giant because she has seen him; girl's life is at risk from other giants who have a history of snacking on kids; girl decides to do something about it and motivates the BFG to do so too; the Queen is involved, the giant is dispensed with and the girl lives happily ever after. This has all the hallmarks of a quest story. Sophie has been thrust into a situation not of her making but accepts a perilous mission to save the world (her world, children). The problem with this film is that it misses out one important element of a quest story: the hero isn't transformed or redeemed as a result of her experiences. Or maybe she is, but we wouldn't know it because the film doesn't take the time to establish Sophie's driving motivation, before plunging her directly into giant land. The opening scenes of the BFG focus on an insomniac Sophie, hiding from the matron at her orphanage, sneaking a book, wandering the halls and shouting at drunks. The shouting at drunks seems an odd moment - we later realise this is establishing her as someone who isn't afraid to stand up to people bigger than herself in order to protect other children, foreshadowing her actions with the giants. We see her as tough. We see her as outspoken. We see her as brave. We don't see her as lonely or vulnerable or friendless. Quite the opposite. The fact she is standing up for the other children at the orphanage implies she cares about them which implies they are her friends. So when she latches onto the BFG as her new BFF it seems odd. In fact, the friendship seems unsettling and uneven. The BFG has form in snatching kids - he's done it once before and it didn't end well (for the boy). It suggests that he is very lonely and will perhaps sometimes do inexcusable things in order to meet his need for company. It doesn't explain what is in it for Sophie. The Sophie we saw in the opening scene might trick the BFG into believing she is his friend, in order to escape. But she evinced none of the deep aching loneliness or emotional vulnerability that would make a kid want a giant as her pal. I found myself comparing this to (the original) Charlie and the Chocolate Factory film. In that we see how much responsibility Charlie carries, how much he cares for his family and how little he has for himself. We completely believe in his wonder at the Chocolate Factory and feel the depth of his devastation when he believes he has failed Willie Wonka. I'm guessing, in the BFG that moment is when the BFG, fearing for her life in Giant Country, takes her back to the orphanage. Sophie refuses to accept her friend is abandoning her. She forces him to reappear and makes him take her with him. She isn't giving up her friend. But for that dark moment to be a dark moment, Sophie's loneliness and her desperate desire to be loved really, really need to be front and centre. We need to be able to empathise with her need for the BFG not to abandon her. Her cunning, courage and protectiveness should give her the means to achieve this end. And, at the end, when we see "Sophie's dream" come to pass - see her loved and secure, it doesn't feel real. Because that isn't the dream of the Sophie who has been presented to us. It's the dream of another Sophie, a vulnerable, rejected Sophie - a Sophie we have never seen. Contrast to the film of Matilda, where her happy ending with Miss Honey feels like the reward for her bravery. The film opens with Matilda's neglect and rejection from babyhood - and her genius. She is clever, cunning, brilliant and daring - but she is also unrecognised and unloved. To really care about her happy ending, for it to make sense, we needed to know that about Sophie too. 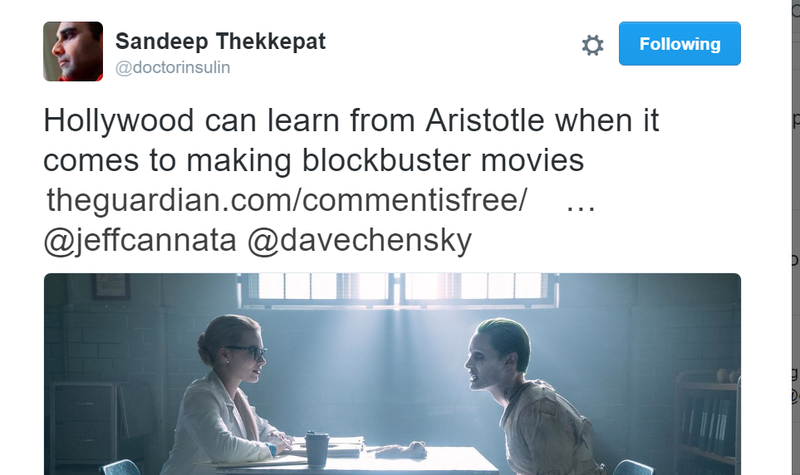 There's a lot to learn from the BFG film. It's a film that should have been brilliant but is actually a bit boring. The acting is good - Sophie is well cast and well acted - and the effects are marvellous. But without that emotional hook, that character arc which is so essential to a quest, it's hard to belive the rest. This has given me insight into what I need to look for in my own work. If I don't establish my character at the start, if I don't give her the opportunity to change and grow as a consequence of her experiences, I'm not really bringing her to life. I'm just presenting spectacle. Thanks for your review. I have seen this movie yet and I can understand you. We are waiting something mystic and unusual from it. But I can't tell exactly whether it is correct to compare it with Charlie. Just saw your comment Diane! 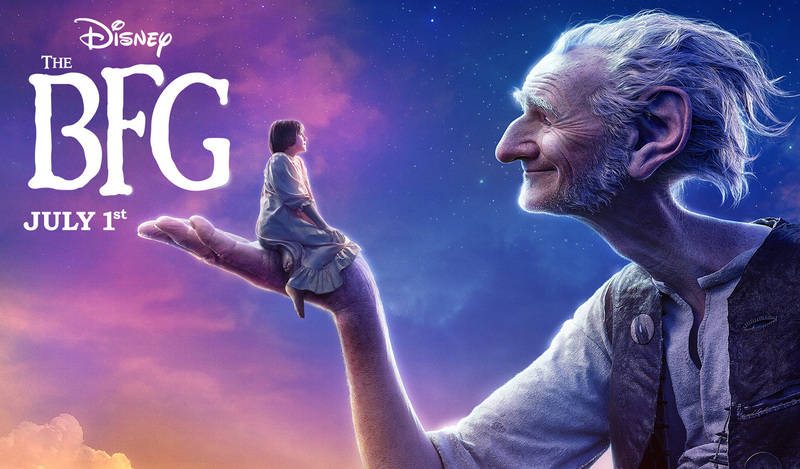 Your fiction is always fresh and emotionally satisfying - they should get you on the script team for BFG 2!